LOOK WEST YOUNG DIVERS, LOOK WEST, and on a clear day you will see the Kerama Islands. These islands are Okinawa's real secret to unbelievable diving experiences. Summer is not over but the end is in sight and now is the time to get serious about seeing the BEST of the great sites that Okinawa Diving offers you. This week I am suggesting that you take that leap of faith and go BOAT DIVING to the Kerama Islands. Summer's hot weather has brought those lovely southern winds that flatten the deep waters between the main island, Okinawa-Shima, and the Kerama Islands. So go ahead take a deep breath and make a commitment to see the rest of the near islands. They are even better than you can imagine. Now that the sales pitch is over you should also consider heading out west with an experienced dive guide, or at the very minimum a boat captain that has experience diving these sites. You will reap the benefits of their experience. Here we go. 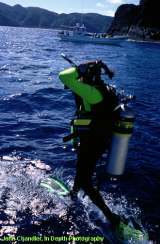 What to expect: First you should expect underwater visibility that will both stagger and excite divers not accustomed to 100 feet(+) visibility. Second you should be prepared for some current. The depth of the channels that run between the islands exceed 300 feet (100 meters) and when the tides are moving you can expect the water to have a respectable force. Now these currents will not sweep you out to sea but you should be prepared to expect some movement of the water. The two sites that I am going to suggest to you are usually protected from the rushing currents experienced in the open water and neither of these sites is to be considered a Drift Dive. Lastly, you should expect to see dazzling reef walls covered in a rainbow of colors radiating from hard and soft corals, eels, lionfish, clownfish playing in your face, sea fans, and ravines to glide in and out of. Excitement? Yes. Worth the hour and a half boat ride? You be the judge but I do not think you will be disappointed. Site Location: Most the dive boats that cater to English speaking divers frequent the eastern islands: Maeshima, Gisshippujima, and Tokashiki. These are my favorites too. My first suggestion is to dive first in the protected pocket at Gisshippujima. This pocket is on the northern side of the island and offers you a wonderful cove that is almost always protected from the southerly winds of the summer. Boat captains usually anchor in the center of the pocket cove. Down the anchor line you go finning out over the ledge that begins in 10 meters of water. I always like to dive around the left side of the cove and along the wall that is heading west. Here you will find interesting cuts and small caverns in the rock wall to explore between 20 and 25 meters (60-80 feet) of water. On our sunny days of summer take a moment to stop and look up. The view of sun rays penetrating deep into the clear water is really breathtaking. The blue fireball silhouettes a menagerie of reef life and is a memory you will want to keep with you. My favorite second dive is on the island Maeshima. It is on the way back to the main island which makes it a favorite of boat captains too. I like the west side of the island and here again you will find a nice wide cove that is protected from winds and currents. This site is a shallower site but the underwater realm here is a continuous carpet of hard corals. Here you find stag horn, brain, mushroom, and coral heads reaching up to 5 meters in height. Your deepest attainable depth, without a lot of finning, is only 15 meters (45 feet). So rest assured you will get lots of bottom time here to enjoy the coral fingers and brilliant white sandy bottom that divides and accentuates the coral beauty. Expect to see turtles and cuttlefish here too. Not to startle you but you should also expect a toothy friend or two to swim by but these reef sharks are so well fed that you are not, and have never been, on their menu. BUT you should give all due respect to the triggerfish. These agile and swift fish will nip you if they are nesting their eggs. They protect their nests in a cone shape area of defense, so if they seem aggressive, swim out of their defensive cone. For shutterbugs these triggerfish make great macro shots. You will think they are really cooperative but actually they are really aggressive. I have several dive buddies that will attest to their cooperation/aggressiveness. Why Boat Diving? Many folks ask me why am I so excited about boat diving when we have some of the greatest and most accessible reefs in the world right here on Okinawa! They are right too, we really are blessed with unbelievable reefs where we can walk to the entry points; however, for those who do not enjoy some of the long walks across the reef and to entry points, for those who do not like the steps at Maeda Point but love the view boat diving is for you. You can expect to pay anywhere from $50 to $80 for your boat diving experience and this usually does not cover the cost of equipment rentals. These prices are well below the rest of the Pacific and well below the costs you can expect to pay in Hawaii, Guam or any of the big name destinations worldwide. The average cost for a tourist diving on Okinawa for these same dives is upwards of $120 to $150. But they get a free (?) lunch and air is provided. You can easily comprehend that boat diving on Okinawa is worth the price. a. All divers can contact "Crew-b" divers. An off-base dive shop located on Highway 58 just past Camp Lester on your left and just past the traffic light that takes you to Hamagawa Lodge. Contact Mr. Eiichiro Masuda at 098 936 4045. English speaking folks can help arrange your trip with Japanese dive boats that leave from Chatan Harbor that is located just across from Camp Lester. This is a great experience and it allows you to get to know your Japanese dive buddies as well. b. Divers with SOFA sponsorship can also contact Kadena Marina. The folks at Kadena Marina have really put some real effort into their fleet of Charter Boats that are available to take you to your dive destinations in the Kerama. Darling's Dream, The "C-Falcon" and "Cheers" are all boats available for your charter. Call 634-6344 for details but my experience has been that money talks and if you are serious about diving the Keramas get moving, drive down and buy your seat early in the month you want to go. The Keramas are popular! c. A third option is an English speaking dive shop on Sunabe Sea Wall called "Fathoms." Rich Ruth, owner of Fathoms, will gladly arrange your trip to the Kerama Islands. Call Rich at 090 8766 0868. What should I take? Most boat captains restrict the popular dive boxes and require that divers bring only their essential equipment in a dive bag. Expect to bring your two tanks, all your dive gear, lots of sun block, a hat and of course a towel. You will also want to pack a lunch and plenty of water or liquid. No dive boat will allow alcohol to be brought aboard. But the most important ingredient is a sense of adventure and plenty of film! See you in the Keramas.